54cm white freestanding cooker is rated 1.5 out of 5 by 2. 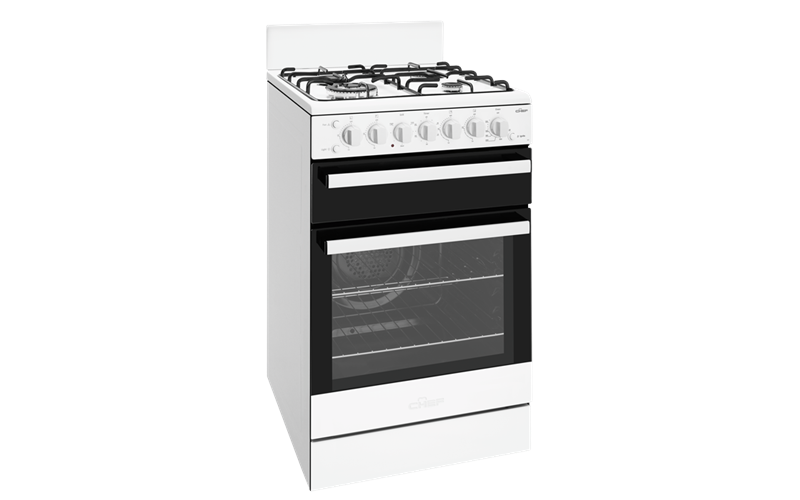 54cm White freestanding cooker with fan forced oven, timer, light, electronic ignition, separate electric grill and 4 burner gas hob with wok burner. Rated 2 out of 5 by Lexie from bad design We have always had Chef stoves but this one is useless. It has an open grate at the back where food falls down and goes goodness knows where, mice food for sure. The grill is badly designed because you can't get the food close enough to the grill for it to cook at a decent rate ie you can't use the top shelf of the grill because the front of the stove is so low it scrapes off whatever you are wanting to cook. So the highest you can get is the second shelf and it takes ages and is extremely uneven. Would never buy another one. We've had this 18 months and are about to throw it away. The wok plate is a nuisance with its raised support, it interferes with pans going on the other three rings. Rated 1 out of 5 by TessC from Looks nice. Had this stove a month and not very pleased with it. The double glass door allows heat to make all the controls very hot. The supposedly cool glass front, isn't. Ours arrived damaged & with no griller handle. Luckily the old griller handle fitted. The griller is a fool of a thing. The single side rails just hang there and move or fall out if you take the tray off. The reflector comes down too far so you can't put anything with height under the griller.